Less of an issue for the C,E,G,W series I guess, but still not perfect. After that comes the big question: will people want to pay the price for that? Forget the TV and the long-term value will be OK, but add reliable sound-sync capability and mounting solutions. I think this is the best solution for Customers AND B&O. It seems so logical and possible if B&O even want to be in that business anymore? Indeed, and interesting that its not quite as obvious from forum members that their first choice is actually a new BV, but more the sound centre the solution that you allude to. Compared to all the back and forth when the Eclipse came out, I do think there has been a shift / general acceptance that the BV value proposition is harder for many to justify (more so than in the past). Much as I've said I'd like a new BV, part of that is symbolic. And if I move up to a 77 inch OLED (next likely move), I can't possibly imagine buying a 77 B&O OLED. I wonder how much you (and others) are willing to ‘compromise’ in terms of usability (reada Beoremote for all functions...), integration in NL, design etc just to get a (less expensive) screen part that you could swap every second year or so? That is indeed a fair point, as often words and actions don't exactly correspond. I don't underestimate usability at all. As and when I change my setup - I suspect I'll only keep my BL speakers, and use something like the new Linn Selekt DSM (which is due to have surround sound added, and 5.1 is enough for me). Subject to how it behaves, the compromise in usability may be offset by having a better music experience, it being a very high end streamer / DAC, and Roon capable, which is something I'm keen to fully explore (subject to cost). The 3rd party TV remote will be able to do the basics with Apple TVs / Blu-Rays. So there's plusses and minuses. 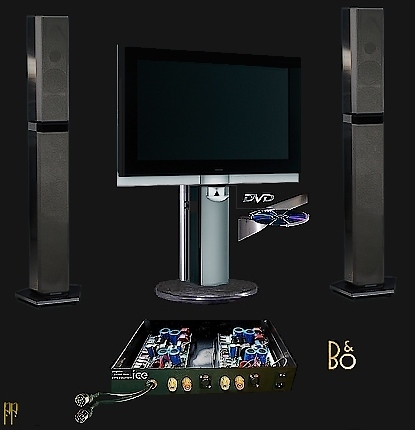 Multi-room TV audio is the only permanent loss - and could still swing me back towards a B&O heart. But no hurry, am happy to see what comes out. LG's OLED TV 2019. You could utilize Amazon Alexa for a wide range of help options. Tunes library, as well as enjoy videos, music, photos from your Apple devices via LG 2019 TV. With regard to HomeKit, you can control the TV using the Home app or, if you wish, just by asking Siri. So what are you missing. Yes TV'S are becoming more capable. But that wasn't the subject of your dream. I'm sure a separate center channel will look lovely on top of the rollable OLED box. Bang & Olufsen is missing also providing WiSA compatible all-in-one models. to the ceiling from the Dolby Atmos sound track. When I chose this, I also had to pay myself. So when the lady chooses a LG TV where the screen rolls up / down.- she must pay. LG's new tv launched in the second quarter of 2019. 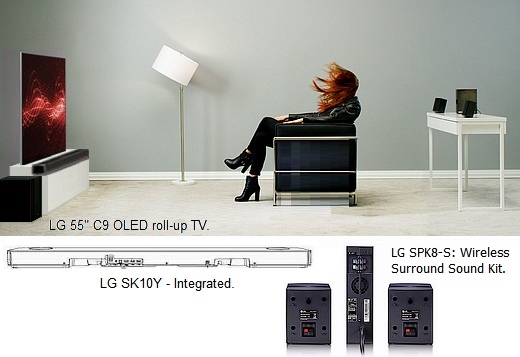 Plus SPK8S Wireless Rear Surround Review - Click here. They have become quite late. LG customer service tells that the come to England within a month. 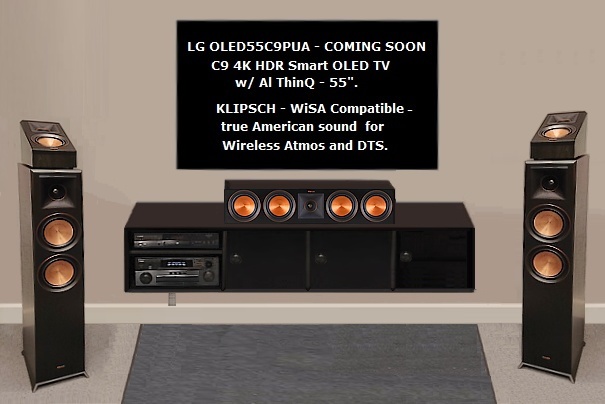 Wow one can only be fascinated by this LG wireless The surround kit can move so much air. Apple AirPlay 2, HomeKit. As with AirPlay 2. Noticed in it. screen part that you could swap every second year or so? a TV switch, I go all the way. If it is 'cheaper' and better, then it is just fine. So....I can conclude that you are willing to compromise. According to your above post - so much that there is no B&O left at all!